You’ve created or paid for a great video showcasing your company. It says exactly what you want your customers to hear, and you can’t wait for everyone to see it. The only remaining question is, how will everyone see it? Too often I see great videos with less than 100 views, even though they are posted on all kinds of social media in addition to a company’s website. So how should you go about posting your video and getting people to watch it? First, let’s start with where your video should live before it’s even posted. There are several options when it comes to video hosting. The most popular is YouTube, the second-largest search engine on the internet. Another reliable platform is Vimeo, a more professional video community. If you choose to primarily use your video on your website for viewing, Wistia is a great hosting service that provides a very clean look. Lastly, if you want your video to make the rounds on social media, Facebook has a direct upload option that can be very useful for gaining views. So which should you go with? Let’s break down the options. The best part about YouTube is that the SEO options are highly favorable. Google obviously weighs YouTube heavily, and therefore boosts YouTube-hosted videos’ visibility. This also in turns helps your website’s overall SEO. In addition, sharing or embedding a YouTube link is very simple, making it easy to share on social media and elsewhere. There aren’t a whole lot of downsides to YouTube hosting, but there is one in particular that is avoided on other platforms. Ever notice the big red play button over top of YouTube videos on websites? The one that practically covers up the middle of your video thumbnail? It makes it very difficult to truly give a preview to viewers as to what your video might look like, which can hurt your views. There are ways to override this with some backend coding, but for those of us who aren’t code-savvy, it makes other platforms a little more inviting and intriguing. If you are a video professional or if you want other professionals to see your video, Vimeo is the place to be. Although not as known for hosting viral videos or popular accounts, it is widely known and accepted as a more professional platform and community. In addition, there is no huge play button covering your video thumbnail, and with an upgraded account, you can eliminate all buttons, branding, etc so that all that you see within your video frame is the video itself. Sometimes a clean look is the most valuable asset to an online video. Wistia is a video hosting service that provides just that, along with a few other benefits. Varying levels of paid accounts (not too expensive, either) allow different options for how your video will look to viewers. Ideally, you want your video to be viewed without any distractions hovering around or over top of it, and that’s what you get with Wistia. Wistia also offers great SEO features, allowing your embedded video to help your site’s visibility and searchability. The downside to Wistia is that it’s mainly used for embedding as opposed to sharing, so social media views aren’t as much a part of the game. Hosting via Wistia is generally best if you simply want your video to live on your homepage or a landing page. Many companies are eager to share their videos on social media, and Facebook might be the most popular medium. The most effective way to promote a video on Facebook is to directly upload it, rather than link a YouTube or Vimeo file. This is important because Facebook will auto-play videos that are self-hosted. When videos auto-play on a timeline, viewers are more likely to stop and watch, if only for a little while. With other platforms, you have to attract a viewer and interest them enough to click play. Auto-play will result in much higher engagement, and although the statistics may be slightly skewed due to people scrolling past the video even after it begins playing, your chances of people sticking around and watching are much greater. Facebook also provides a clean look for your video, and also gives you the option to boost your post for a small fee. 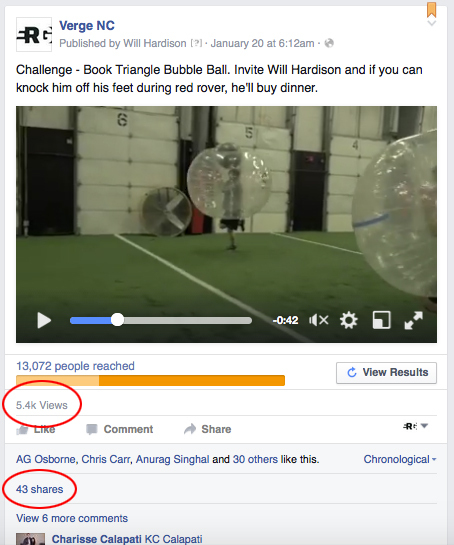 The only real downside to Facebook-hosted video is that your video lives and stays there. As long as you are comfortable and confident that your video can get views and be effective on Facebook alone, it’s a great option to go with. Even the best videos hosted on the right platform aren’t always guaranteed thousands of views. There are a few more ways to help your video be as effective as it possible can be. First, be sure that your video opens up with visually stimulating images. The opening seconds are what make or break the attention span of your viewers, so you want to make sure they are intrigued enough in the opening frames for them to stick around for the rest of what you have to say. A talking head generally isn’t the best way to open a video that you’re broadcasting to people who don’t know anything about your company. Another important key is the caption that you choose to accompany your video, especially if you’re sharing on social media. Be sure to introduce your video with a sentence that is interesting but also gives a small taste of what viewers will see if they press play. Give them an incentive to watch, otherwise they will just keep scrolling. Finally, the most important part of your video should be the call to action. Your video has a purpose, and that purpose is not simply to get to a certain amount of views. You want to convert those views into clicks, and the clicks into emails captured, or whatever your end goal may be. A smart way to quickly and easily go from a CTA to a customer conversion is to create landing pages that link with your video. Post your video, provide a CTA for viewers to click on that will take them to a custom page of your site geared towards them. Maybe you have a teaser video on your social media post and the full video on the landing page. Whatever you figure out is the most effective method, be sure that your video is driving business for your company, and that you’re not focused on views alone. It doesn’t take an award-winning video to get views and drive people to your website, but the methods you use for hosting and sharing will make or break your video’s success.